One way Jamaica has attempted to address the problem of the landless is to provide housing on government lands through a program known as Operation PRIDE. It was implemented in 1994 under the Ministry of Water and Housing’s National Housing Development Corporation Limited. Operation PRIDE works with designated community organization/provident societies to offer a framework for the working poor to access land and basic services through incremental development. 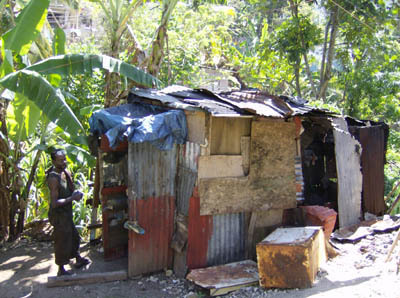 Delroy Jenkins outside his shack at Brown Lane, outside Montego bay, Jamaica. One such group is Community Organizations for Management and Sustainable Development (COMAND) a grassroots, umbrella organization made up of more than thirty (30) community-based organizations (CBOs) and community development agencies (CDAs), headquartered in western Jamaica. According to chairman Owen Dave Allen, COMAND was established by community organizations to provide mutual support, guidance and community strengthening programs under the government’s shelter program. But things have not always gone well with Operation PRIDE, which has been in the past the subject of official inquiries over operational irregularities. While there are more than 130 Operation PRIDE sites throughout Jamaica most are brown field at varied stages of development. These sites represents more than 60,000 housing solutions but many people are are unable to bemnefit and gain a home. This is one reason COMAND’s Allen has launched an appeal in Jamaica and among its overseas nationals to seeking funding support to cover the cost to provide a house for a 59 year old man, Delroy Jenkins, who who lives in a hovel at Brown Lane, Granville, on the outskirts of the tourist capital of Montego Bay. “The cost for a one room board structure is US $5,000,” said Allen, whose circular explains that the unit will be constructed under the supervision of the COMAND. “COMAND has been successfully engaging communities to dialogue on the issue of land tenure and to register provident societies to provide the legal/institutional framework for their negotiations, partnership building and management,” said Allen. He told Abeng News Magazine that COMAND is currently seeking to engage the new administration which came to power September 2007, in a review of the PRIDE process, to examine best principles and practices, to source development funds, to forge alliances, partnerships and dovetailing of government social program to make the process work. Allen may be contacted at odamaxef@yahoo.com for information on assisting or contributing to COMAND’s work.